BarList - Reinforcing steel quantities for cost estimating software from Rick Brice at WSDOTFree! Bridge Automation - Bridge design software and other resources. Caltrans - Many free utility programsFree! cecBridge - Automated bridge drafting suite. Colorado DOT - ECSU - Many applications for bridge analysis, and a very cool COGO application. Concrete Box Girder Section Properties - from Bridge AutomationFree! Expansion Joint Spacing Design - DynaSoftFree! Florida Bridge Software Institute - FB-Pier, Brufem, Shaft-SPT and more. Florida DOT - Many design programs and MathCad sheetsFree! Herbert G. Whitman, PE. - Lots of Free Bridge and Structural Engineering Utilities Free! 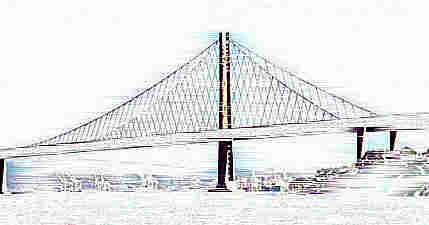 NECO, Engineers - Many different bridge design solutions. OPTI-MATE - Home of MERLIN DASH & DESCUS (straight and curved girder bridge design and rating), SABRE (sign bridge), and TRAP (truss). QConBridge - LRFD Live Load Superstructure analysis from Rick Brice at WSDOTFree! PGSuper - Design of precast I-Girder Bridges from Rick Brice at WSDOTFree! Simplified Bridge Solutions - Software for the "average" bridge designer. Spreadsheet Solutions for Structural EngineersFree! Texas DOT - Sign design software and moreFree! VBent - Concrete pier design and analysis. VisualDesign - Moving loads analysis/design/evaluation software for Steel, Concrete, Prestressed & Composite structures. WBFL Components - WSDOT's software bridge component librariesFree! BridgeInspect For bridge, culvert, and other structure management and inspection. CLM/Systems - The "Home of COGO"
ROAD/SITE Designer - PC-based program for designing roadways and computing site earthwork. OpenSees - Open System for Earthquake Engineering SimulationFree! Atlas - Windows 95/98/NT beam analysis programFree! Washington State LBAM components - Part of the WBFL components. Incorporate live load analysis in our Excel spreadsheets!Free! Adapt Software Systems - Prestressed/Reinforced Concrete Design & Analysis. ALGOR - General Purpose F.E. Department of Civil and Mechanical Engineering, United States Military Academy - Free Utilities! DTColumn - Interaction diagrams for round concrete columnsFree! FastFrame - Windows 95, 98 & NT Two-Dimensional frame analysis programFree! IDARC - Nonlinear structural analysis of concrete behavior. University at BuffaloFree! LISA MECHANIC - 2D and 3D frames, plates, and solid elements; statics and dynamics. 1300 node version is Free! The Mechanical Engineering Zone - Java apps for beam analysis and more Free! NONLIN - Nonlinear Dynamic Time History Analysis of Single Degree of Freedom Systems Free! OpenSEES - Software framework for seismic structural analysis Free! Pikaso Software - Reinforced concrete utilities. PROKON - FE Software and more. ROBOT 97 - Very graphical F.E. analysis software. Skeleton- A program for the analysis of plane framesFree! Structural Software Inc. - Online Java Apps for structural analysis.Free! USFOS - "The Ultimate Software Package for Non-linear Static and Dynamic Analysis"
gINT Geoenvironmental and Geotechnical Software - User-customizable report generation for borehole and boring logs, well log plotting, and fence diagrams. ASME - Downloads Library - Probably the most comprehensive engineering software downloads library on the net. Boss International - Mostly Water Stuff - Some COGO-like Programs. SEAOC - California Structural Engineers post free softwareFree!